The internet lead Tony Dovis to Waiheke and this stunning location in Enclosure Bay. Originally from Hamilton, the internet was the first place Tony turned to when thinking about making the move to the island. After sifting through numerous properties, he arrived in August last year on a house-hunting mission. “We looked at lots of ‘normal’ houses which didn’t appeal. When we saw this one it felt right, it felt comfortable coming in,” he says. The house is a stunning sun trap with expansive sea views over Palm Beach and beyond on one side, and over towards Auckland and Rangitoto on the other. The house was designed by Lapp & Toft Architecture Ltd and was built by Island 2000 builders, who completed construction in December 2010. Originally designed and built for a family with two children, the previous owners were based overseas and had initially hoped to set up home on Waiheke. Work commitments thwarted that plan however, so reluctantly they had to sell. Their specifications suited the new owners perfectly and they are now relishing their new life on Waiheke. “We find the commute to Auckland a bit tiring, but it’s lovely coming back to Waiheke, it feels like coming back to a sanctuary. It has a more community feel,” says Tony. 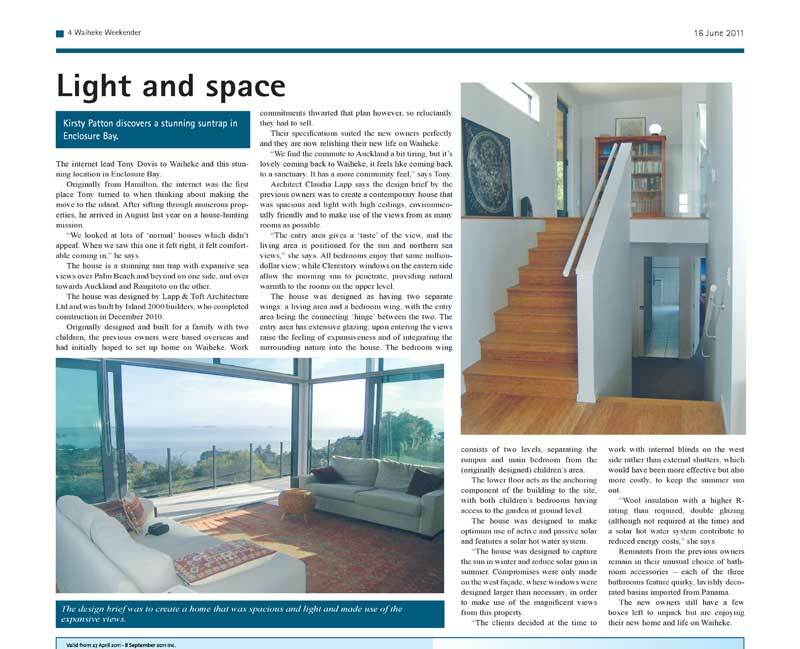 Architect Claudia Lapp says the design brief by the previous owners was to create a contemporary house that was spacious and light with high ceilings, environmentally friendly and to make use of the views from as many rooms as possible. “The entry area gives a ‘taste’ of the view, and the living area is positioned for the sun and northern sea views,” she says. All bedrooms enjoy that same million-dollar view; while Clerestory windows on the eastern side allow the morning sun to penetrate, providing natural warmth to the rooms on the upper level. The house was designed as having two separate wings: a living area and a bedroom wing, with the entry area being the connecting ‘hinge’ between the two. The entry area has extensive glazing; upon entering the views raise the feeling of expansiveness and of integrating the surrounding nature into the house. The bedroom wing consists of two levels, separating the rumpus and main bedroom from the (originally designed) children’s area. The lower floor acts as the anchoring component of the building to the site, with both children’s bedrooms having access to the garden at ground level. The house was designed to make optimum use of active and passive solar and features a solar hot water system. “The house was designed to capture the sun in winter and reduce solar gain in summer. Compromises were only made on the west façade, where windows were designed larger than necessary, in order to make use of the magnificent views from this property. “The clients decided at the time to work with internal blinds on the west side rather than external shutters, which would have been more effective but also more costly, to keep the summer sun out. “Wool insulation with a higher R-rating than required, double glazing (although not required at the time) and a solar hot water system contribute to reduced energy costs,” she says Remnants from the previous owners remain in their unusual choice of bathroom accessories – each of the three bathrooms feature quirky, lavishly decorated basins imported from Panama. 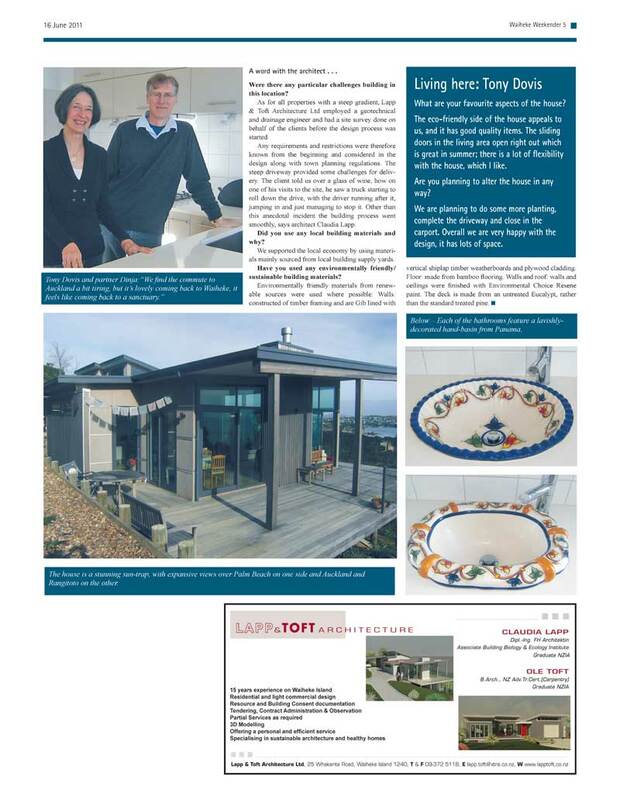 The new owners still have a few boxes left to unpack but are enjoying their new home and life on Waiheke. Were there any particular challenges building in this location? As for all properties with a steep gradient, Lapp & Toft Architecture Ltd employed a geotechnical and drainage engineer and had a site survey done on behalf of the clients before the design process was started. Any requirements and restrictions were therefore known from the beginning and considered in the design along with town planning regulations. The steep driveway provided some challenges for delivery. The client told us over a glass of wine, how on one of his visits to the site, he saw a truck starting to roll down the drive, with the driver running after it, jumping in and just managing to stop it. Other than this anecdotal incident the building process went smoothly, says architect Claudia Lapp. Did you use any local building materials and why? We supported the local economy by using materials mainly sourced from local building supply yards. Have you used any environmentally friendly/ sustainable building materials? Environmentally friendly materials from renewable sources were used where possible: Walls: constructed of timber framing and are Gib lined with vertical shiplap timber weatherboards and plywood cladding. Floor: made from bamboo flooring. Walls and roof: walls and ceilings were finished with Environmental Choice Resene paint. The deck is made from an untreated Eucalypt, rather than the standard treated pine.